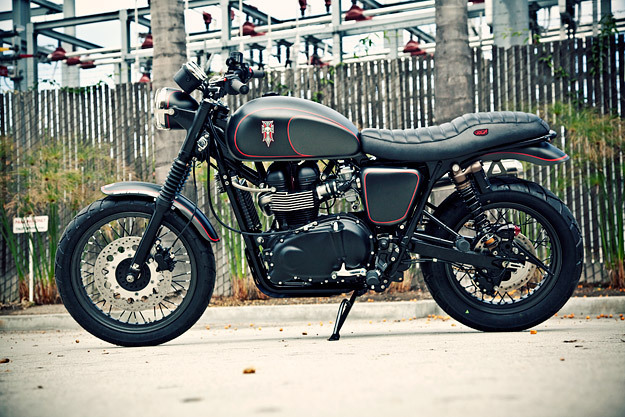 Most of the bikes we show here don’t reflect the truth of mainstream motorcycle customizing. They’re bikes to aspire to, or be inspired by. The reality is that most people who customize their bikes do it in a piecemeal fashion: changing a part here and there, doing a little of the work themselves and contracting out the trickier stuff, and poring over catalogs and websites to find the elusive parts that will provide a useful performance kick or a different look. This is something that Roland Sands understands very well, and one of the reasons he’s become so successful. 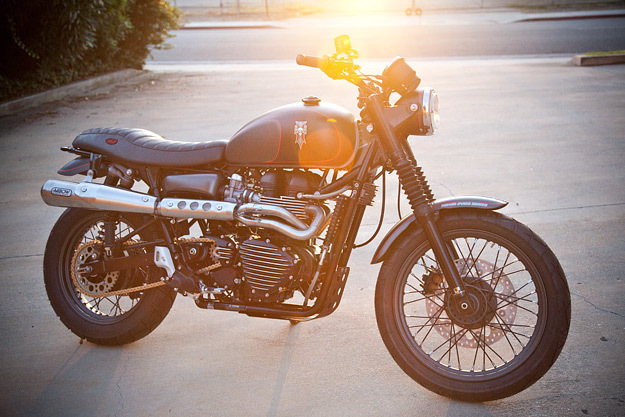 The Triumph Scrambler 900 we’re looking at here exemplifies this approach perfectly. RSD built it for the Tony Hawk Foundation, and it was sold for $32,500. It went under the hammer at a charity auction to raise money to build free public skateparks in low-income areas. 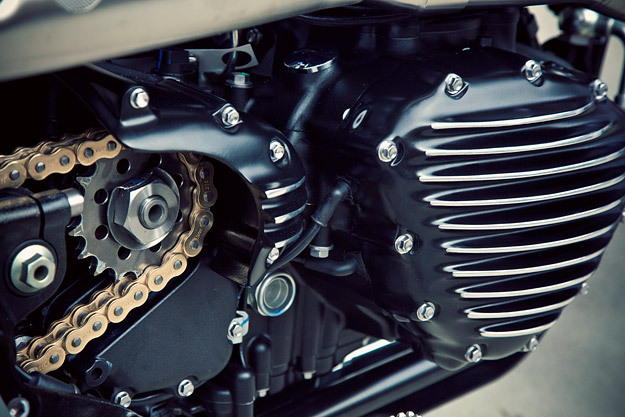 Sands chose a 2011 model Scrambler 900 as the base, and upgraded the dynamics and rider experience using bolt-on parts that won’t damage reliability. 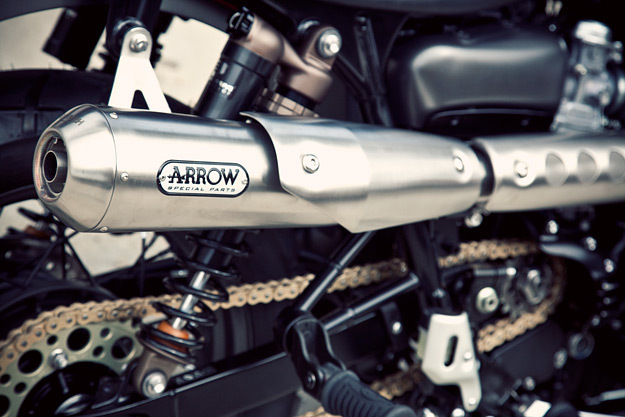 The engine internals have been left unmodified, but a performance boost comes from an Arrow 2-into-1 stainless steel exhaust—plus K&N filtration and an air injection removal kit from British Customs. (This reduces the operating temperature of the engine and also eliminates popping during deceleration, especially with aftermarket pipes). Braking has been improved with an oversized floating front rotor, and the suspension has been worked over by Progressive: the front forks have been re-sprung and re-valved, and the rear shocks replaced with Progressive’s 970 series reservoir shocks. Tires are Dunlop Trailmax TR91s. The original 7/8″ handlebars are gone, replaced with Renthal Fatbars attached to RSD risers. 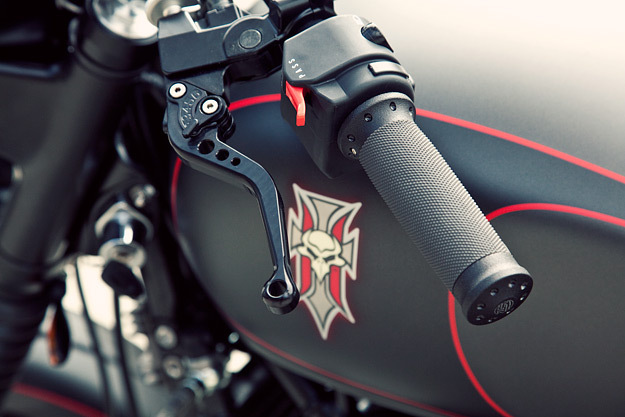 Adjustable Pazzo brake and clutch levers are matched to RSD ‘Black Ops’ tracker grips. 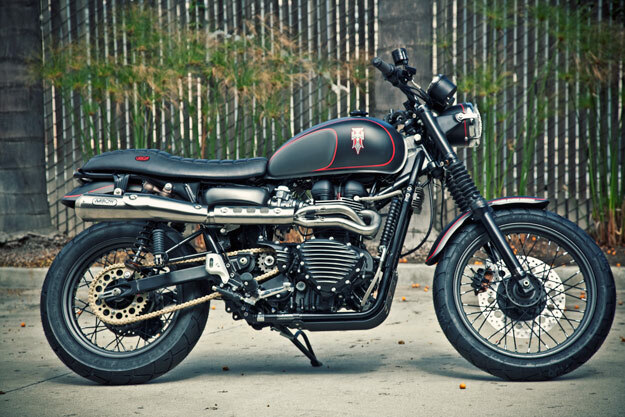 The Scrambler 900 seat has been replaced by a recovered Triumph Thruxton item, and sleek new turn signals and brake lights have also been installed. Neat visual touches are the cast aluminum ribbed stator cover from The Speed Merchant and the new aluminum battery box. The rear fender has been cut down and all the bodywork, including the headlight bucket, has been repainted in a satin titanium color. I know several proud owners of Hinckley Triumphs, and this is the kind of subtle but effective custom job that inspires them. It’s not radical and it doesn’t need to be expensive, but it’s bikes like this that keep the wheels turning in the custom business.